Okay, so the ‘perfect’ suit is somewhat sartorially subjective concept up to the individual, but graphic designer Jake Gilchrist didn’t let that stop him from creating this amazing infographic about classic elements that will never go out of style. Working from an extensive GQ profile on what makes the ideal suit, Gilchrist took the often confusing written descriptions of something visual and turned them into an easy to digest design. From where your shoulders should sit to how to accessorize your suit, Gilchrist covers it all with a glance. 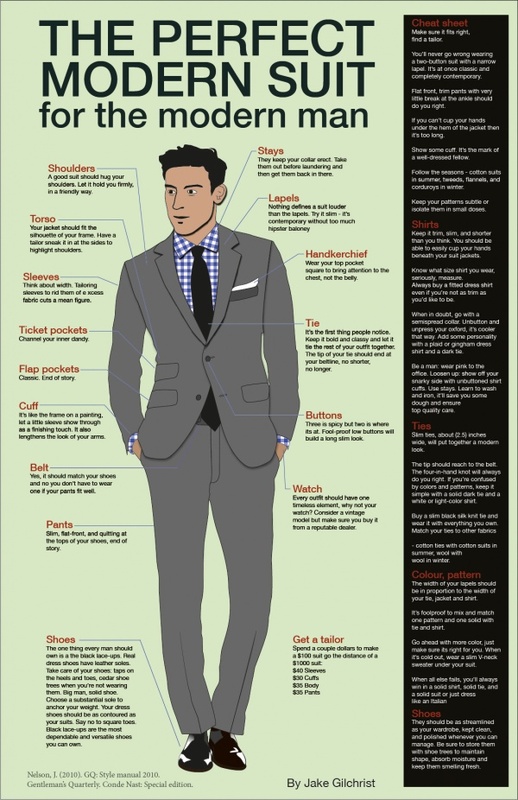 This entry was posted in Accessories, Belts, Black Tie, Cufflinks, Feature, Pants/Bottoms, Suits, Ties and tagged infographic, Jake Gilchrist, The Perfect Suit. Bookmark the permalink. I don’t know about the shirt choice in the illustration but would say he nailed many good points.